Never thought this would be possible but it seems it is. The following site offers movies scenes in ascii format. What this means, basically, is that the movie has been converted using only ASCII characters. Movies include Lord of the Rings, Spiderman, the Matrix and lots more. Detail level is amazing and you can select font size as well ranging from 1 to 12. My 1024*768 was not big enough for the large numbers but the movies look great even in a small size like 2. Update: The site is no longer available and there does not seem to be a replacement for it either anymore. You can still run a search for "movie name" ascii to find some of the more popular movies in ascii, but the majority of results that you will get will be static stills and not movies. Update 2: The popular video hosting site YouTube seems to host a couple of Ascii movies that you can watch right on site. Follow this link to open the Ascii movie search results listing directly. Just click on any video in the results to watch the movie on YouTube. Here is a short selection of well done movies that you may enjoy. The first one is the intro of the popular The Matrix movie in full Ascii glory. And here is the popular Matrix "doge this" scene converted to Ascii. Next up is a custom made movie that uses the music from the popular movie Titanic. Lots of dancing going around in the movie. And here is part of the Star Wars movie in Ascii. You find additional ascii art movies on YouTube or other video hosting websites. You can watch the full Star Wars Episode IV movie in Ascii. 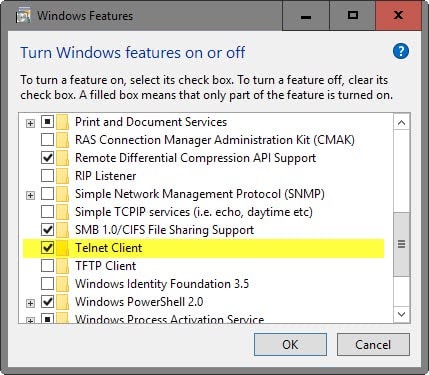 Windows users need to install the Telnet Client on their system before they can do so. Use Windows-Pause to open the Control Panel. Click on "Control Panel Home". Click on "Turn Windows features on or off". Check "Telnet Client" in the window that opens and hit okay. Use the command telnet towel.blinkenlights.nl to start the movie. Once you are done watching the movie you can uninstall the Telnet Client again on the system if you don't require it. Alternative: Someone has recorded the movie and uploaded it to YouTube. You can watch it in full on the video hosting platform as well. Watch several Ascii movies right away on the site, use Telnet to watch Star Wars Episode IV in Ascii, or search for more movies in Ascii on YouTube. my apologies :)…i wud hv mailed u d reason…but didn’t had ur email.